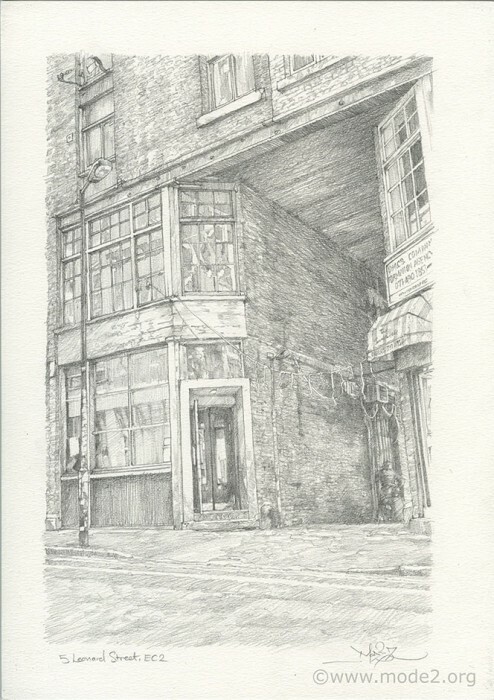 This was another Francesca Gavin commissioned drawing for the Soho House group, and I think that it is at the 76 Dean Street address. 5, Leonard Street EC2 was actually the location of the original Dragon Bar, which was an amazing pub in Shoreditch; turning into a club when regular pubs announced “Last Orders” at 11pm, and staying regularly open until 2am. With its turntables set by the entrance, it also had guest DJs on most nights, but was not pretentious in any way, and catered for a very mixed crowd, alongside its regulars. Ben Eine used to have his studio right upstairs, while the patrons Justin and Adie also organised exhibitions on the first floor. I myself had one there October 19th 2004. Developers forced it to close in March 2008, and it eventually moved to Shoreditch High Street, where it became something else altogether.